Smoky Jo’s courses for this year are already underway! 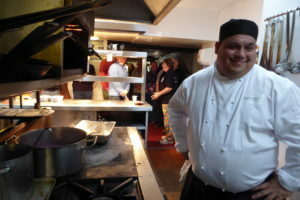 We met a wonderful group of people at the Wild Boar at the beginning of February – it was a good day, the weather was OK and the Wild Boar staff were on top form – a big thank you to them. Especially to Matt who was there when we arrived before 9 am (he’d probably been doing breakfasts since 7 am) and was still there when we finished our smoked banquet around 10 pm. 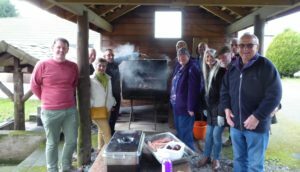 If you would like to learn to smoke food with us – we’ve been smoking food for years and teaching home smoking and commercial smoking since 2006 – please check our website for our course dates and content. Playing with food and playing with fire – what’s not to enjoy?! We were really thrilled for Gordon, and touched that he took the trouble to call us. He said our course had been fantastic and he couldn’t thank us enough. 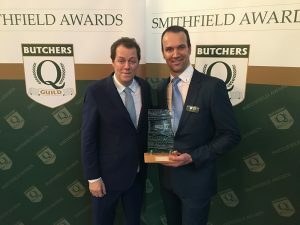 We have taught hundreds of people to smoke foods over the years and some have gone on to open artisan smokehouses but this is the first top national award for someone who we have taught to smoke – as far as we know! We are looking forward to getting over to Harrogate to sample some of his smoked streaky bacon – and congratulate Gordon in person – as soon as we can! 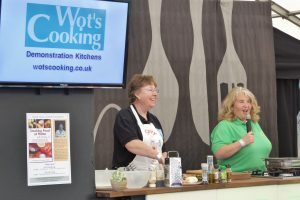 A final note that I can’t believe I didn’t blog about last year… Jo was one of the chef’s at Ludlow Food Festival in 2016 and we had a great couple of days out touring and tasting… and tasting… oh yes, and shopping!